We use citation data of scientific articles produced by individual nations in different scientific domains to determine the structure and efficiency of national research systems. We characterize the scientific fitness of each nation−that is, the competitiveness of its research system−and the complexity of each scientific domain by means of a non-linear iterative algorithm able to assess quantitatively the advantage of scientific diversification. We find that technological leading nations, beyond having the largest production of scientific papers and the largest number of citations, do not specialize in a few scientific domains. Rather, they diversify as much as possible their research system. On the other side, less developed nations are competitive only in scientific domains where also many other nations are present. Diversification thus represents the key element that correlates with scientific and technological competitiveness. 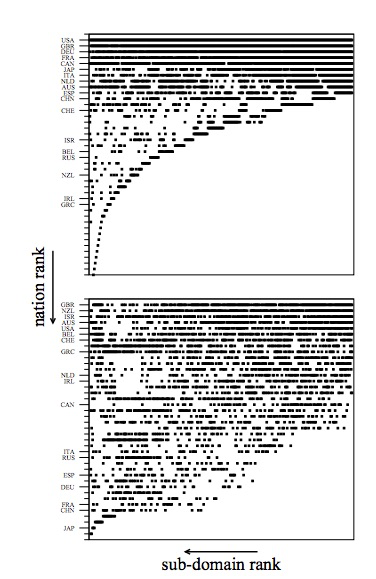 A remarkable implication of this structure of the scientific competition is that the scientific domains playing the role of “markers” of national scientific competitiveness are those not necessarily of high technological requirements, but rather addressing the most “sophisticated” needs of the society.